Cool 18® Pant is rated 4.5 out of 5 by 188. Rated 4 out of 5 by Comfortable and nice from Comfortable I bought these pants for work. They are very comfortable pants. The material is lightweight and cool. 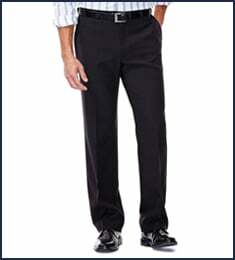 Rated 5 out of 5 by Rh66 from Easy purchase nice slacks with light weight fabric and good finish. 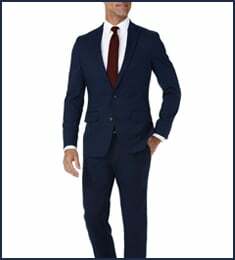 Rated 4 out of 5 by Bill B from Long time customer I’ve used Haggar clothing for well over 25 years and have always benn pleased with them. 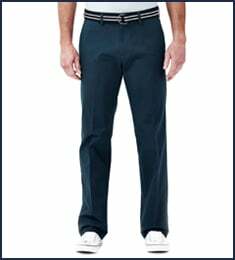 Rated 5 out of 5 by ChrisJ from Always top quality and fit The Cool 18 is hard to beat for nice looking pants at a great price. 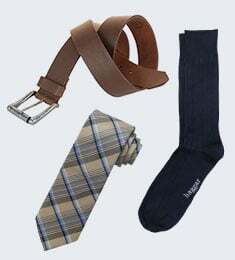 Good quality and fit. Allows movement. 5 star rating!! Rated 3 out of 5 by Mitchell from Fabric is a Great Magnet I wore the first pair of these slacks yesterday, and when I got back home I found that they were covered in dog hair and other specks of matter -- the material just attracts it all like a magnet! Rated 3 out of 5 by Rhody from Pants Great pair of pants, very limited expansion for advertised expandable waist. I would jump up a size for waist next time. Almost no expansion.